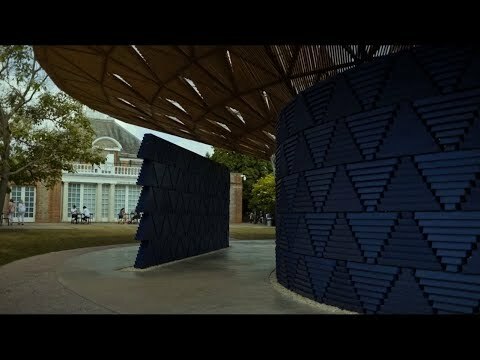 Kéré, who leads the Berlin-based practice Kéré Architecture, was the seventeenth architect to accept the Serpentine Galleries’ invitation to design a temporary Pavilion in its grounds. 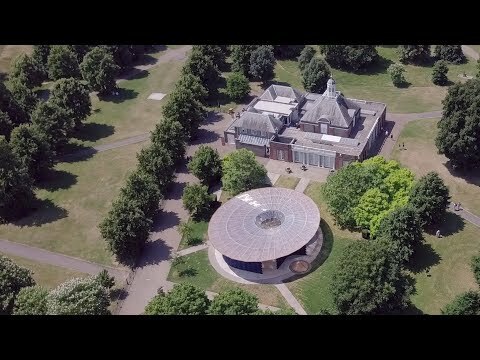 Since its launch in 2000, this annual commission of an international architect to build his or her first structure in London at the time of invitation has become one of the most anticipated events in the global cultural calendar and a leading visitor attraction during London’s summer season. Serpentine Artistic Director Hans Ulrich Obrist and CEO Yana Peel made their selection of the architect, with advisors David Adjaye and Richard Rogers. Inspired by the tree that serves as a central meeting point for life in his home town of Gando, Francis Kéré designed a responsive Pavilion that sought to connect its visitors to nature – and each other. An expansive roof, supported by a central steel framework, mimicked a tree’s canopy, allowing air to circulate freely while offering shelter against London rain and summer heat. Kéré positively embraced British climate in his design, creating a structure that engaged with the ever-changing London weather in creative ways. The Pavilion had four separate entry points with an open air courtyard in the centre, where visitors could sit and relax during sunny days. In the case of rain, an oculus funnelled any water that collected on the roof into a spectacular waterfall effect, before it was evacuated through a drainage system in the floor for later use in irrigating the park. Both the roof and wall system were made from wood. By day, they acted as solar shading, creating pools of dappled shadows. By night, the walls became a source of illumination as small perforations twinkled with the movement and activity from inside. Inspired by Kéré’s stories of gathering, debate and community, the Serpentine Pavilion 2017 hosted a new series of weekly community picnic talks, Radical Kitchen. On eight Wednesdays in July and August, a different London group or campaign organisation assembled in the Pavilion to share their recipes for creating meaningful social change. Forging a connection with food, these picnics were co-hosted and catered by Mazí Mas, a pop-up restaurant and award-winning social enterprise run by migrant women, which seeks to unearth the flavours of modern London for everyone. On the occasion of the GUEST, GHOST, HOST: MACHINE! Marathon 2017, Raqs Media Collective presented Hollowgram, a new holographic sculpture commission which considered the inner life of power. Situated in Francis Kéré’s Serpentine Pavilion for the duration of Frieze Week (3-8 October, 10am-6pm), Hollowgram reflected on majesty and the marble and bronze statues commemorating historical figures in Kensington Gardens. The Pavilion was also the platform for a summer of Park Nights, the Serpentine’s annual series of experimental and interdisciplinary encounters. Practitioners in the fields of art, architecture, music, film, philosophy and technology were commissioned to create new, site-specific work in response to Kéré’s structure, offering unique ways of experiencing architecture and performance. Build Your Own Pavilion, the digital platform and nationwide architecture campaign conceived with funding support from Bloomberg Philanthropies, invited young people to consider the relationship between architecture and public space, to ask critical questions about the future of their cities and to design the cities in which they would like to live. The Serpentine’s Architecture Family Pack, designed by artist Katie Schwab, was a chance for children and their families to experience Francis Kéré’s 2017 Pavilion from playful and original perspectives. Diébédo Francis Kéré is the principal architect at Kéré Architecture based in Berlin, founded in 2005. Kéré was born in 1965 in Gando, Burkina Faso, west Africa and trained at the Technical University of Berlin. Kéré Architecture has been recognised nationally and internationally with awards including the Aga Khan Award for Architecture (2004) for his first building, a primary school in Gando, Burkina Faso; LOCUS Global Award for Sustainable Architecture (2009); Global Holcim Award Gold (2011 and 2012); Green Planet Architects Award (2013); Schelling Architecture Foundation Award (2014) and the Kenneth Hudson Award – European Museum of the Year (2015). Projects undertaken by Francis Kéré span countries including Burkina Faso, Mali, China, Mozambique, Kenya, Togo, Sudan, Germany, and Switzerland. He has taught internationally including the Technical University of Berlin and he has held professorships at the Harvard Graduate School of Design and Accademia di Architettura di Mendrisio in Switzerland. Kéré’s work has recently been the subject of solo exhibitions: Radically Simple at the Architecture Museum in Munich (2016) and The Architecture of Francis Kéré: Building for Community, Philadelphia Museum of Art (2016). His work has also been selected for group exhibitions Small Scale, Big Change: New Architectures of Social Engagement, Museum of Modern Art, New York (2010) and Sensing Spaces, Royal Academy, London (2014). 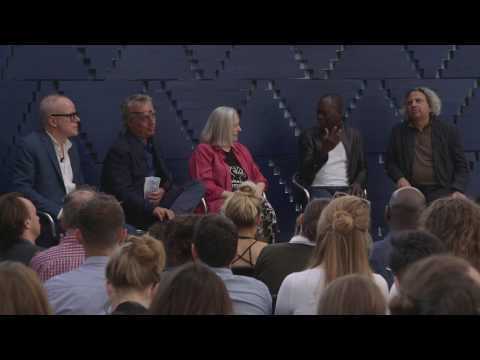 Berlin-based architect and designer of the 2017 Serpentine Pavilion, Francis Kéré was in conversation with Stefano Boeri (Stefano Boeri Architetti), Mohsen Mostafavi (Dean, Harvard Graduate School of Design), Hans Ulrich Obrist (Artistic Director, Serpentine Galleries), and Saskia Sassen (Professor, Columbia University). Inspired by Francis Kéré’s stories of gathering, debate and community around a tree in his village of Gando, Burkina Faso, the Serpentine Pavilion 2017 became host to a series of community picnic talks this summer, Radical Kitchen: Recipes for Building Community and Creating Change. Repeats every day until Sun Aug 20 2017.